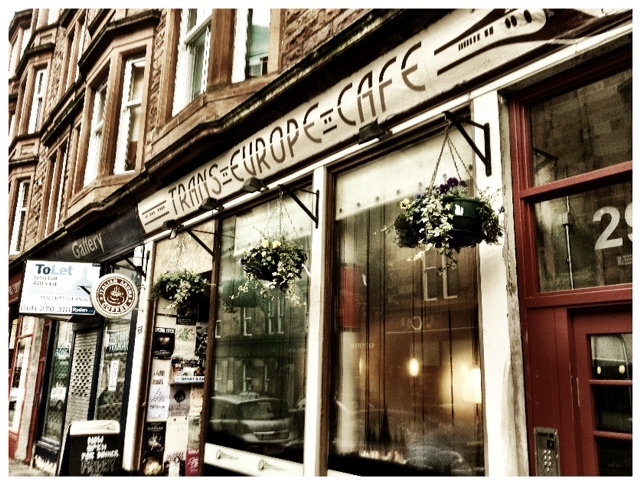 Trans Europe Cafe by night – a Glasgow must! I already knew and loved Trans Europe Cafe as thee perfect breakfast place. Cool laid-back surroundings, Tony’s no-nonsense service and totally tasty food make it one of my favourite spots in the city. Board games and being able to get breakfast at 4pm on a Sunday only adds to the appeal. And then Trans Europe started serving up evening nosh during the weekend. So how could I resist? Magically the bustling day-time café transforms into the perfect intimate night- time spot. Low lights and soft music lull us into a sense of comfort. And lovely smelling food tempts our taste buds. 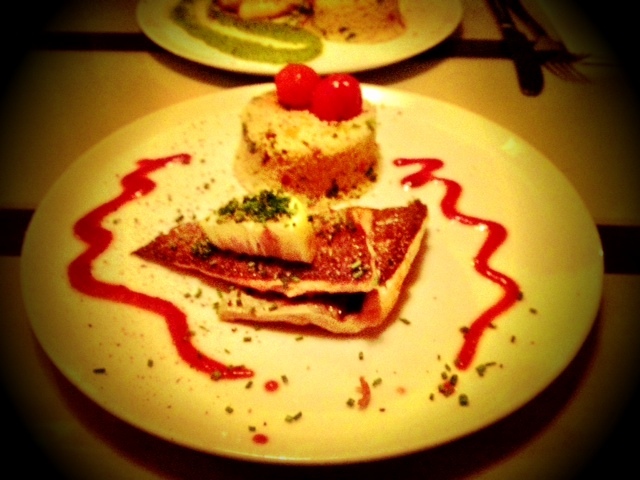 I opt for the beautifully prepared cod. I am not disappointed. Visually it is artfully presented. But it’s not just a pretty dish. It’s bursting with flavour – a song for your mouth. 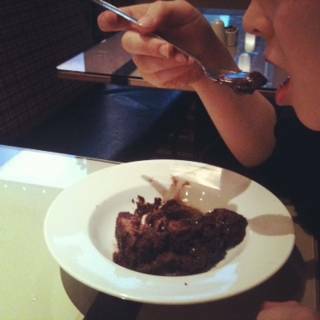 And although I have never had room during the day for dessert, I save just enough space to enjoy the most luscious chocolate delight. Yum! By night Trans Europe offers the same sensational service, serves up a concise menu of delectable food and is set to become a Glasgow evening hot spot. In fact, do book because looking around every table is full. Their evening menu displayed on the chalk-board is ever-changing. All the more reason to come back time after time. Day or night, Trans Europe is a must. Delighted that Trans Europe Cafe is soon to expand. Yum! The perfect shelter from the rain – board games included! It’s been raining, drizzling or threatening to spittle forever. It seems. I’m walking through Trongate in the late afternoon trying to find a place to escape the wet when I spy the Trans Europe Cafe on Parnie Street. Intrigued by the name, we go in. Once inside the warmth instantly steams up my glasses. But the very friendly guy working at the café instinctively offers me a tissue to sort myself out; he is delightful. The cosy welcoming café lives up to its name. It’s a mishmash wonder where old bus seats function as chairs and walls are a jumble of maps and world-wide postcards. There’s pictures of old Glasgow with working trams – a bit of inspiration for Edinburgh. We settle in for a hot drink and cake ; the hot chocolate fudge cake disappears so quickly I can only assume my boys enjoyed it. For me it’s all about warming up with peppermint tea – though the lemon & ginger and honey & vanilla are equally tempting. But wonderful food and soothing drinks are only part of this place’s charm. 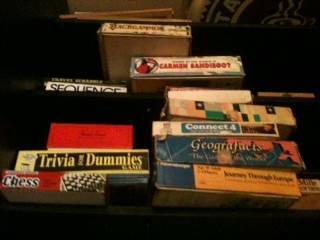 An eclectic selection of games to play- from classic Connect 4 to Geografacts – are also on offer. Really the perfect way to whittle away a winter afternoon and only £9.50 for three drinks and two pieces of cake. Bargain! Through the week Trans Europe Café is open from 10 – 5 and on the weekends they’re open till 10pm, serving up small but perfectly formed evening meals, all under a tenner. I leave – reluctantly – out into the cold. But their scrumptious sounding Sunday Brunch will lure me back again. I can’t resist two of my absolute favs Eggs Benedict (£5.75) and Smoked Salmon bagels (£5.95).